In SAP hybrid environment, such software-as-a-service as well as Private Cloud offerings, service level reports are essential to monitor and control SAP solutions that are virtualized across multiple services and cloud infrastructure. A service level report defines realistic, quantifiable service-level objectives, and track their performances in real time to measure and monitor application service levels against business objectives. Generating reports is typically a manual, time-consuming and error-prone process. The failure to produce timely reports is increased by the introduction of new business processes or requirements. Building and maintaining a service level report should be an easy task that a SAP service manager could realize in a few clicks based on any technical and business indicators relevant to his objectives. Finally, the construction of the report should be as automated as possible but it should allow manual modifications to correct any unwanted deviations produced during the automatic data collection. The Service Level Report capabilities of Focused Insights for service level agreement (SLA) tracking and reporting are unique in the industry of SAP Solutions Management. By combining automation, flexibility and completeness, Focused Insights provides a centralized management console to design, build, and monitor service agreements for SAP Solutions. Enable SAP services to measure and report on the value SAP IT provides to the business. Align IT organization with business priorities and expectations. Measure and manage your levels of service in a consistent automated manner. History and predictive SLA tracking. Import SAP Best Practices for SLR definition. Enables reports to be changed quickly and easily. No need for custom software development to automatically integrate data from multiple different sources. The current compliance for the last report execution. The compliance history for all reports. The current compliance corresponds to the number of compliant Service Level Objectives (SLO) selected during the report execution. SLOs are always associated with a measurements metrics corresponding to a SAP Key Performance Indicator. 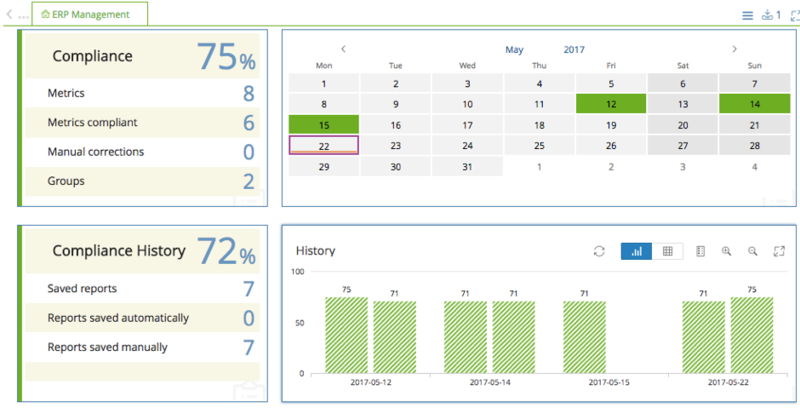 In addition, a calendar view and an history bar chart are provided to gain insights on the compliance history of the report. Assigning a target objective to the metric. Assigning target type to the target. 2 compliancy methods are supported: Maximum and Minimum. To support real-time and historical reports, the indicators values are collected based on predefined period and granularity. Maximum: maximum value of the measurements. Minimum: minimum value of the measurements. Average: mean value of the measurements. Last: last value of the measurements. Accumulation: sum of all measurements values. On-demand Reports: On-demand reports can be created manually based on current data. Automatic creation of reports for daily, weekly or monthly execution is managed by an automatic job. You have access to the reports history for root-cause analysis, trend analysis or early warning before SLAs are breached. You have the possibility to change saved reports to update SLA compliance. When authorized, adding new metrics, removing metrics, changing SLAs can be done at any moment. Edit metric’s attributes is achieved through the edit button.